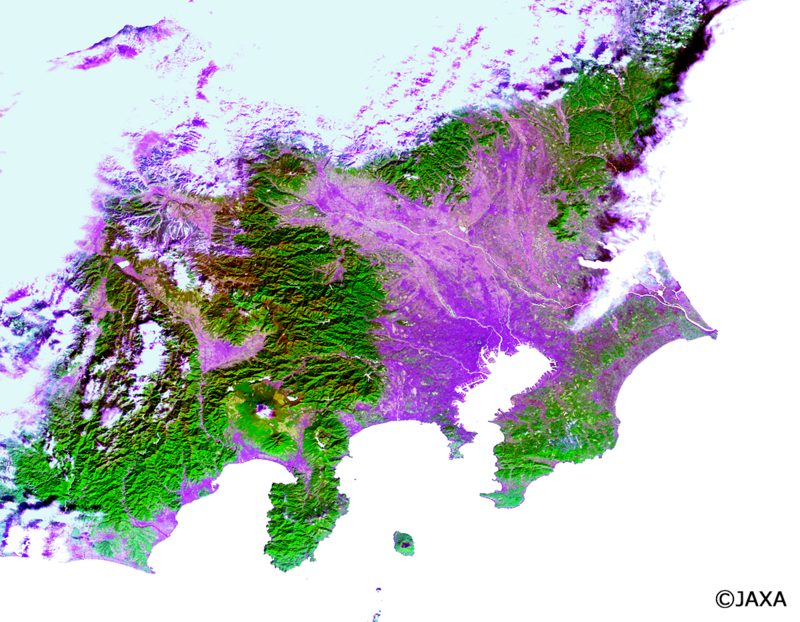 SHIKISAI Observation Data Acquired by SGLI. 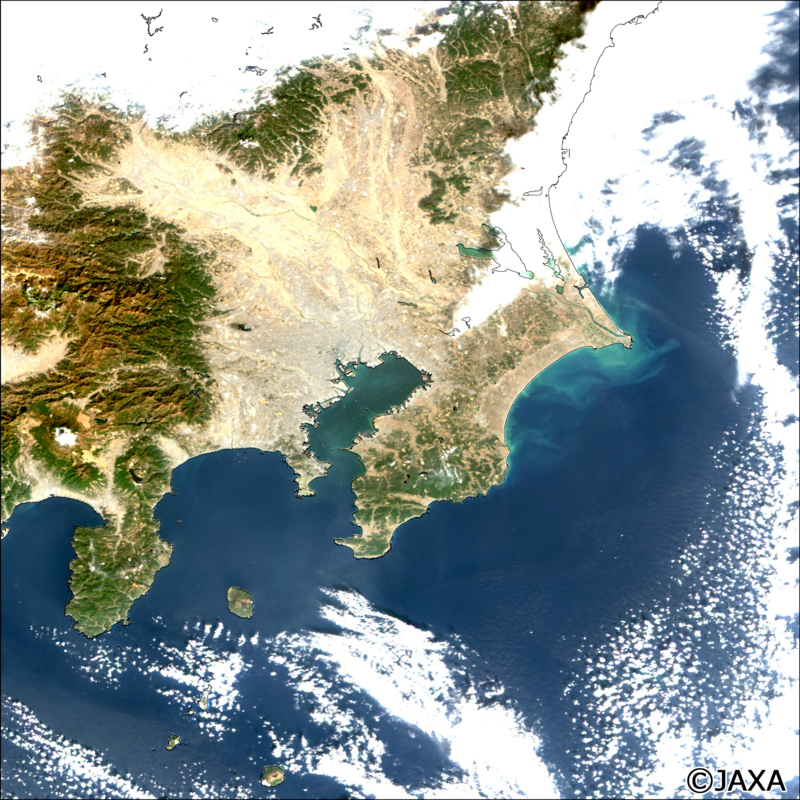 The Japan Aerospace Exploration Agency (JAXA) has released some observation images on the Earth acquired by the Global Change Observation Mission - Climate "SHIKISAI" (GCOM-C). The SHIKISAI was launched from the Tanegashima Space Center at 10:26:22 on December 23, 2017 (Japan Standard Time). 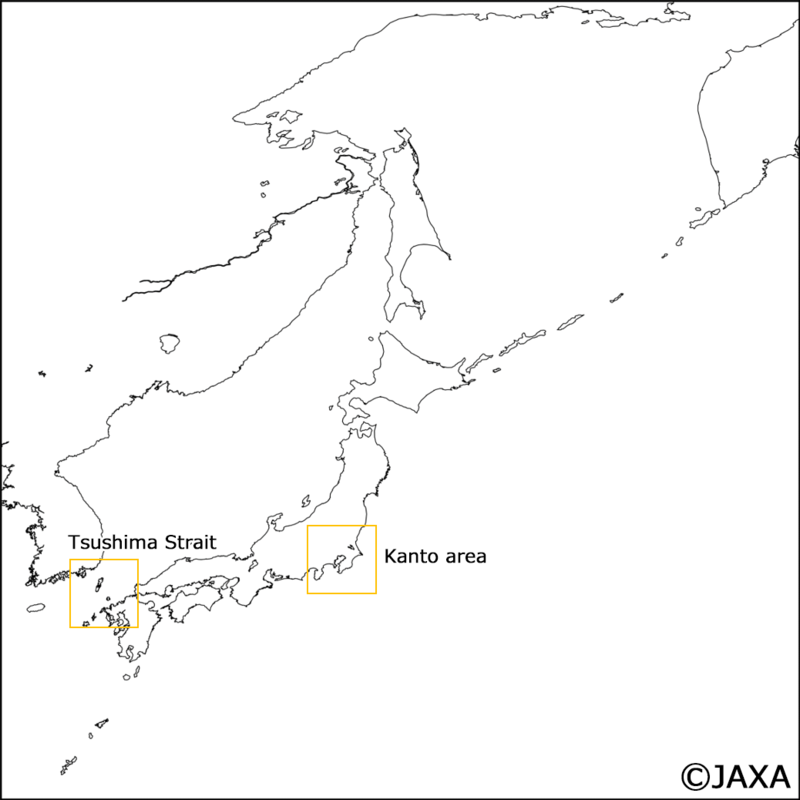 These images are obtained by using the test radio wave transmitted from GCOM-C/SGLI on January 1st to 6th, 2018 (JST). 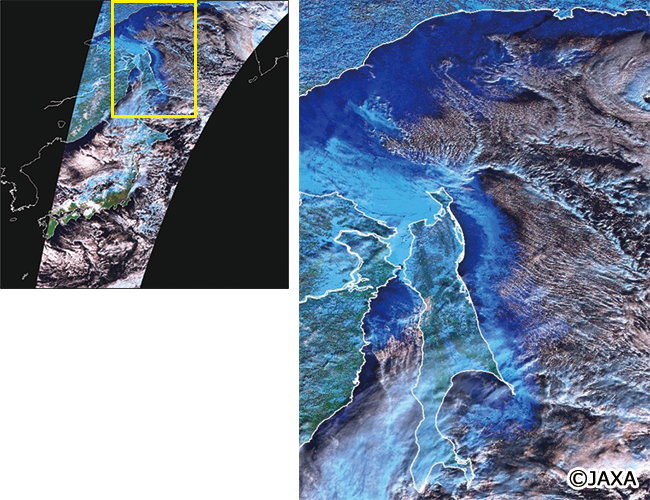 The image shown in the left is a true color composite* image and the image in the right is a false color composite image** of 250 m spatial resolution captured over Kanto area in Japan with SGLI onboard the SHIKISAI around 10:30 on January 6th 2018 (JST). Evergreen forests are seen in dark green in the true color image and are not discriminable, while in the false color image evergreen forests are clearly visible in bright green colors. On the other hand, small yellow patches are seen in the enlarged false color image shown in the lower right. These are golf courses covered with faded grasses in winter. 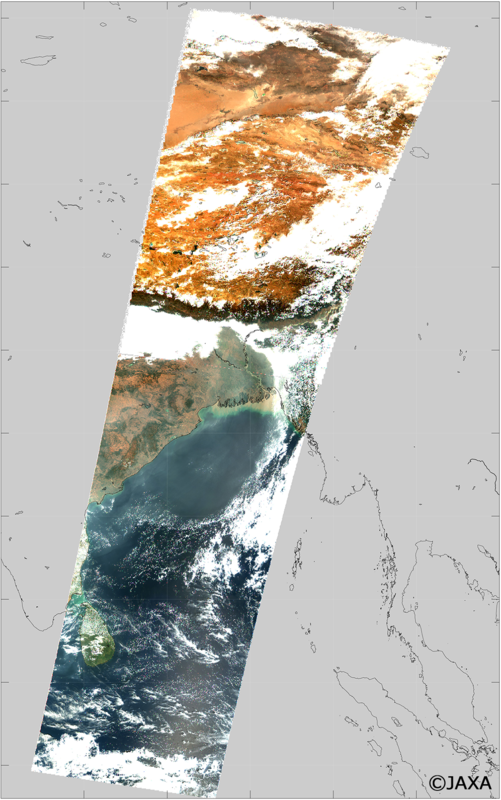 The images are (left) a true color composite* image, (middle) near-ultraviolet (NUV) image, and (right) degree of polarization (DPOL) image captured over Ganges river, India with SGLI onboard the SHIKISAI around 11:40 on January 3th 2018 (JST). 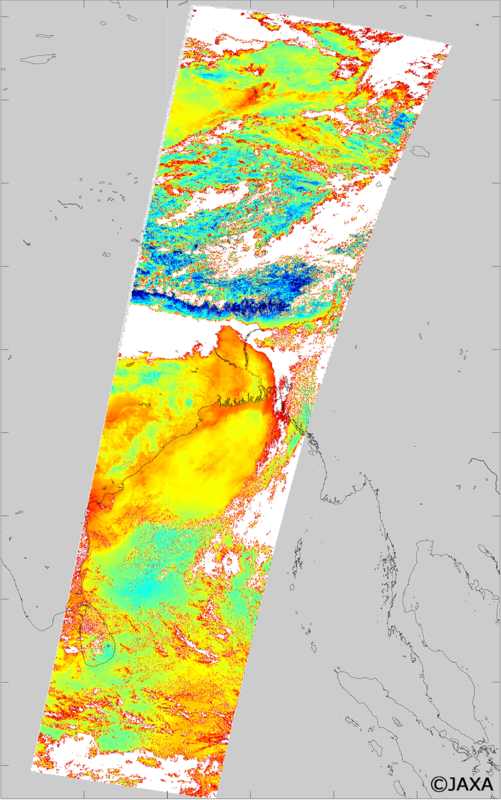 Dense aerosols are seen around the mouth of Ganges river to coastal ocean in the NUV image. In the DPOL image the solar light reflected at ocean surface are seen to be highly polarized. 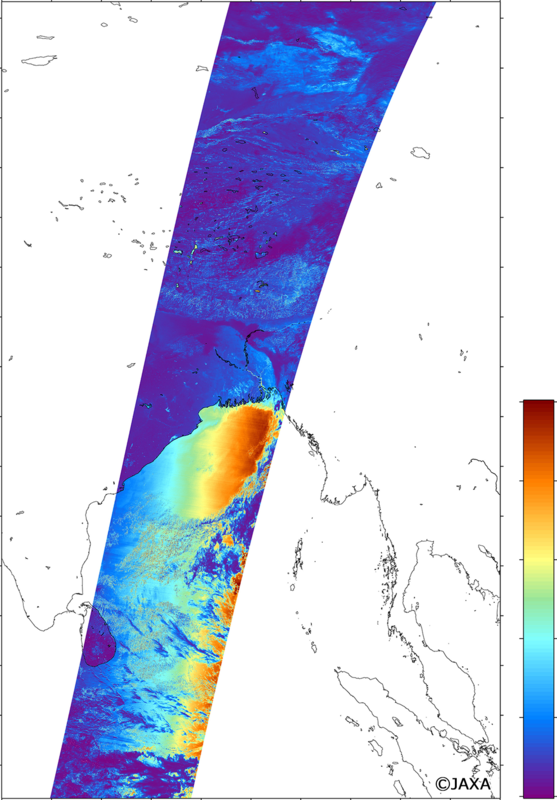 SGLI can observe aerosols over land and ocean using the functions of NUV and polarization observations. These images are color composite* images of around Tsushima island (middle) and around Kanto area (right) observed with SGLI onboard the SHIKISAI around 11:10 on January 1st 2018 (JST). Locations of the images are shown in the left image. SGLI can observe the spatial distribution of ocean colors with the spectral channels of high sensitivity designed for ocean color observation in order to retrieve the concentrations of suspended matter and phytoplankton in water. These observations are useful for fishery prediction and the monitoring of red tide occurrence. 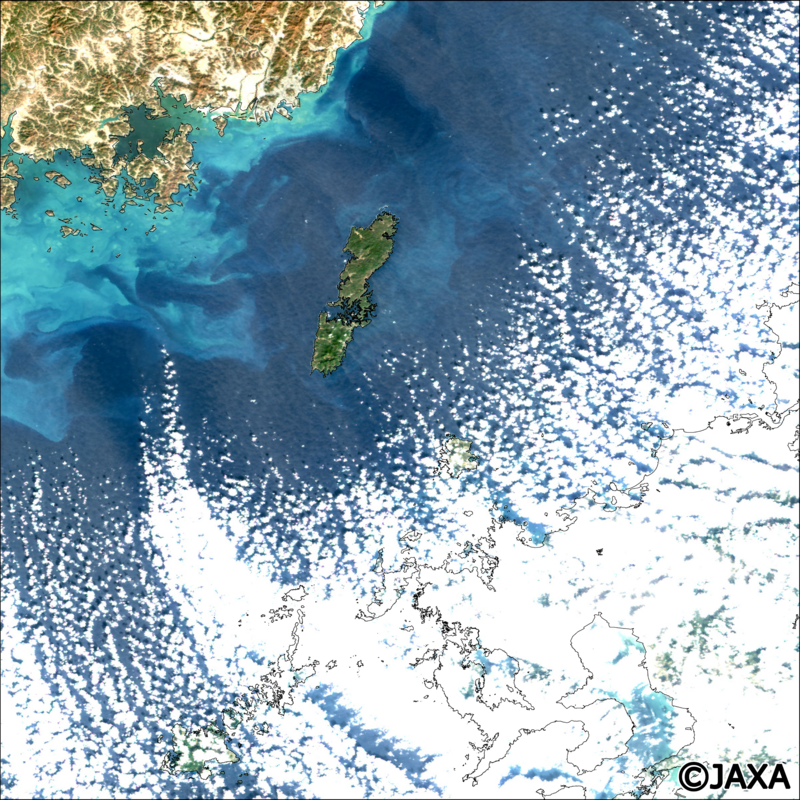 This image is a true color composite* image of 250 m spatial resolution captured over the Okhotsuk Sea and Japan Islands with SGLI onboard the SHIKISAI around 10:20 on January 6th 2018 (JST). 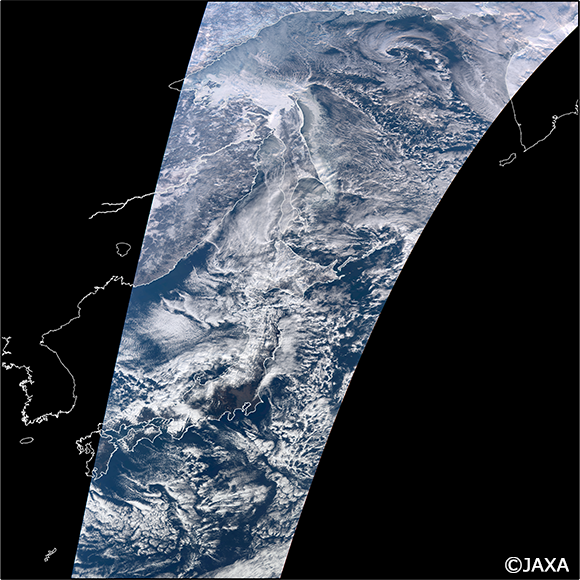 Snow, sea ice, and clouds are shown in white. Land and ocean areas are seen in dark brown and blue colors. 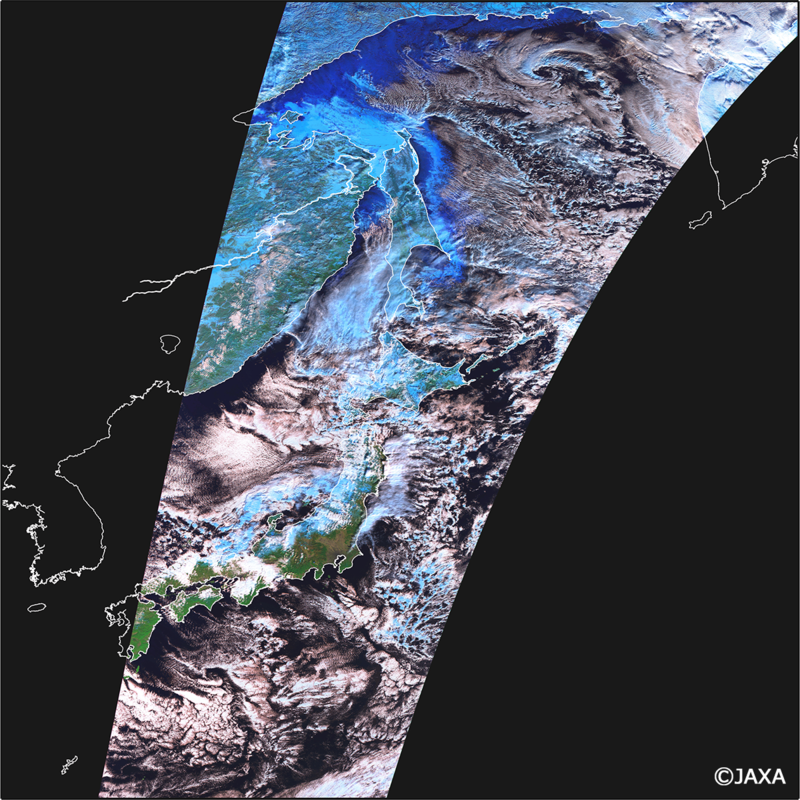 This image is a false color composite* image of 250 m spatial resolution captured over the Okhotsk Sea and Japan islands with SGLI onboard the SHIKISAI around 10:20 on January 6th 2018 (JST). Snow and sea ice are shown in deep blue while water and ice clouds are seen in white and light blue, respectively. 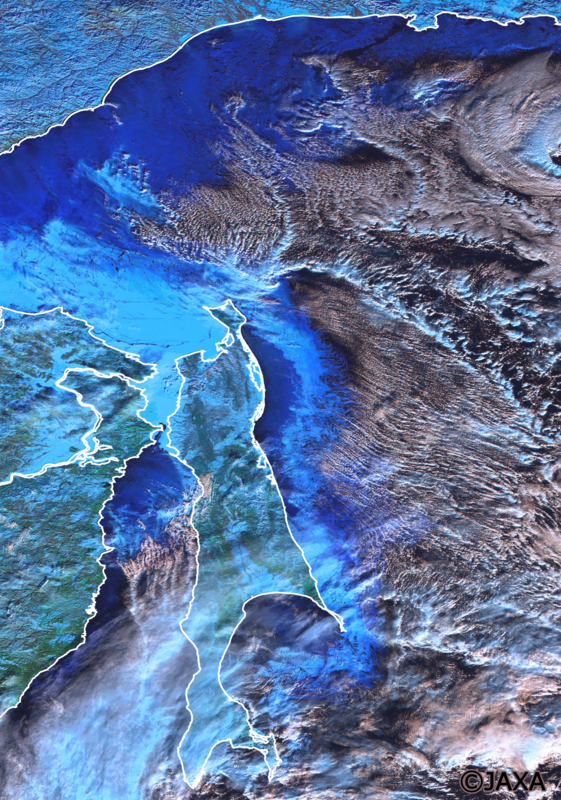 Sea ice are formed along the eastern coast of the Eurasia Continents and spreads along the east side of Sakhalin flowing down to the south. We will continue the initial functional verification (for about three months after launch,) then confirm data accuracy by comparing it with observation data acquired on land, and perform initial calibration and inspection operations including data correction.